Whitney's World: Graduation and leaving. I'm officially a college graduate! Goodbye Texas Tech! 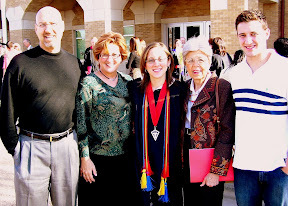 This is a picture of me with my family and my grandmother after graduation last weekend. I've got about a week left here in town, and then I'm off to Dallas to start a job in January. It's strange to be leaving for good, but I'm excited about my job and being closer to my Dallas family for a while. Also, it's only six hours away, so I think it's a good place to start. It could be worse. It could be Houston. Anyway, I'm going to try to start keeping up with this journal again, especially since I should get to do some traveling for my job...starting with NYC in January! I can't wait. I love New York, but I've never been in the winter. Please keep in touch w/me. I want to keep up with one of my very favorite "children" of God.